Discover the unique jackets from the Original 1954 Edition. The Lander Jacket is a quilted down jacket in 100% real down with direct injection. Let yourself be enveloped by this incredibly soft and comfortable garment that will cover you on every occasion during the Fall Winter season. This garment is equipped with all the necessary details to stay warm during the winter months: elastic and windproof cuffs, high and padded neck to stay warm and comfortable, wrap-around hood and with elastic micro-band on the edge to prevent cold wind, practical pockets on the bottom to protect hands. The outer fabric is a high-quality nylon finely refined and with a vivid and slightly satin look. The front closure is with zip and double slider with logo. Buy it today on our official website in 6 fun colors. 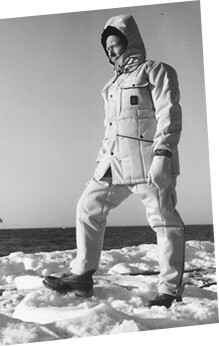 This down jacket from the Original 1954 Edition is a unique and original piece, in full RefrigiWear style. The Lander Jacket is the ideal winter jacket for those looking for an intriguing look, extremely comfortable and warm enough to face the Fall Winter season. Wear it on any occasion, take it with you for a walk downtown or fold it and insert it into your bag in a practical and simple way to use it during a mountain holiday. Built externally in a soft, high quality nylon, finely researched, with a lively and slightly satin look. Internally lined with a slightly crispier and contrasting colored nylon. High neck to cover from the wind and characterized by bright and contrasting colors. Let yourself be enveloped by this incredibly soft and comfortable garment that will cover you on every occasion. The padding is in 100% real down with direct injection. This garment is equipped with all the necessary details to stay warm during the winter months: elastic and windproof cuffs, wraparound hood with elastic micro-band on the edge to prevent the cold from passing, practical pockets on the bottom to protect the hands. Three internal pockets to store precious objects. Front closure with zip and double slider with logo. Buy it today on our official website in Red, Green Mustang, Royale Blue, Dark Blue, Anthracite Gray or Black. Remember that all the RefrigiWear items are to be treated with care; correct treatment will guarantee the maintenance of performance and appearance over time.